Dhaka, Jan 25 (Just News): BNP secretary general Mirza Fakhrul Islam Alamgir fears the verdict on graft charges against BNP chairperson Khaleda Zia has been predetermined. "This illegitimate government has already written the verdict. Judgement will be what the prime minister wants it to be," Fakhrul told a press conference at the party's Naya Paltan central office on Thursday. 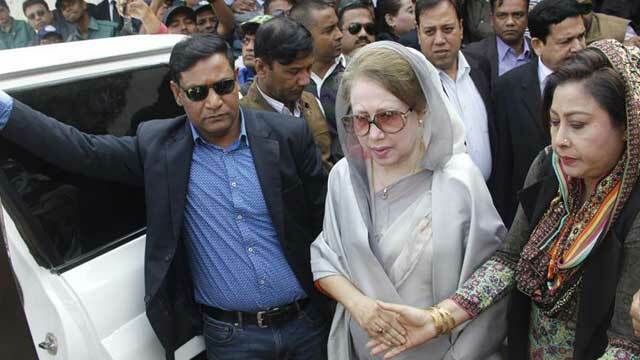 The BNP leader referred to the statement made by prime minister Sheikh Hasina's special emissary HM Ershad in Lalmonirhat on Tuesday, when the latter said BNP chief Khaleda will be jailed as per court verdict before the 11th parliamentary polls. Mirza Fakhrul said Ershad's statemment was tantamount to contempt of court but no action was taken in this regard. The BNP leader expressed his apprehensions at a time when the court fixed the date for announcing the judgement on Zia Orphanage Trust case on 8 February. The BNP secretary general alleged that Khaleda Zia has been implicated in a total of 24 "false cases" to keep her out of elections. The process of another case -- Zia Charitable Trust case -- is nearing completion. "The entire trial process is questionable as the court issues unprecedented orders giving frequent dates for Khaleda Zia," Mirza Fakhrul said. He argued the speedy trial process proves that the government is scared of Khaleda Zia's popularity and it wants to stop her from contesting the elections. Fakhrul said such 'humiliating and inhuman behaviour' with Khaleda Zia is reminiscent of repressive policies of military and fascist rulers. Condemning the govenment's 'ill-attempts', the BNP leader called for withdrawal of all false cases against Khaleda and all others and stopping killing and enforced disappearances. The BNP leader mentioned that the opposition leaders and activists were being detained randomly in recent weeks and forced to make 'false' confessional statements. He pointed out that when there is an utmost necessity to create equal opportunity and a level-playing field for all political parties for the sake of free and fair elections, the AL regime is increasing killing in the name of crossfire, and through enforced disappearances to foil congenial atmosphere for credible elections. "This illegal government is trying to keep the opposition parties out of electoral race the way it held a voter-less election (in 2014)," said Mirza Fakhrul. He insisted that all politically motivated cases have to be withdrawn if fair atmosphere is to be created. "Parliament has to be dissolved. The prime minister has to step down. These are our (main) demands," Fakhrul said. BNP standing committee members Mirza Abbas and Gayeshwar Roy, senior joint secretary general Ruhul Kabir Rizvi and vice chairman Shamsuzzaman Dudu were present at the briefing.